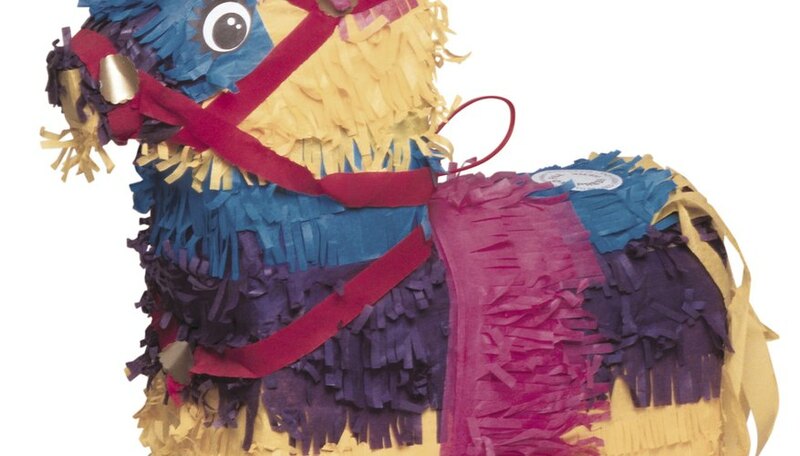 Papier mache is a simple, easy way to make a sculptured centerpiece or a pinata for a party. Balloons are a great material to use as a base, as they provide structure while you are sculpting and can be popped later to leave you with a hollow sculpture. A polar bear can be made with six balloons, white tissue paper and a permanent marker. Blow up the two standard balloons to represent the body and head of the polar bear. Make one larger than the other. Blow up the four long balloons to represent the legs. Tape the head balloon to the body balloon, then tape the leg balloons to the body balloon. Bunch some newspaper in the shape of ears and tape them to the head. Tear the rest of the newspaper and the tissue paper into strips. Put some flour in a bowl and add water, stirring constantly, until you have a thick, liquid paste. Dip a strip of newspaper into the paste and pull out of the bowl slowly with one hand while feeding it through the thumb and index finger in the other hand to remove excess paste. Place the strip of newspaper onto your balloon sculpture and smooth down with your fingers. Try to have as few lumps as possible. Repeat with the other newspaper strips to form a single layer completely covering the balloon sculpture. Overlap the newspaper strips as little as possible while leaving no gaps between strips. Make another layer of newspaper strips over the first layer. Repeat twice more for a total of four layers of newspaper over your balloon shape. Dry overnight. Your sculpture must be completely dry before you continue. Make more flour paste and cover your balloon sculpture with layers of tissue paper in the same way you did the newspaper strips. You should no longer be able to see the print on the newspaper once your final layer of tissue paper is on your sculpture. Allow to dry overnight. Dry completely as before. Draw eyes, a nose and a mouth on your polar bear with a permanent marker. Stick a small pin into the underside of the body, head and each leg to pop the balloons. Genevieve Findelaville is a freelance writer specializing in areas within the arts. Findelaville holds a Master of Music in voice performance from the Chicago College of Performing Arts and a Bachelor of Music in voice performance with an emphasis in musical theater and opera from Capital University.